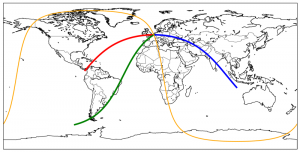 Plotting great circles with Basemap, but knowing only the longitude, latitude, the azimuth and a distance. Only the origin point is known. Instead of modifying (for now) the basemap package, I’ve translated a routine I found on the internet. Ed Williams wrote very good scripts for shooting great circles (see his website : http://williams.best.vwh.net/gccalc.htm). Note, I haven’t contacted Ed, so, please note this code is the property of Ed, I’ve just translated the script. azimuth = baz + 180.
for which you only have to provide the starting lat/lon, the starting azimuth. This function expects the basemap (m) as first arg. 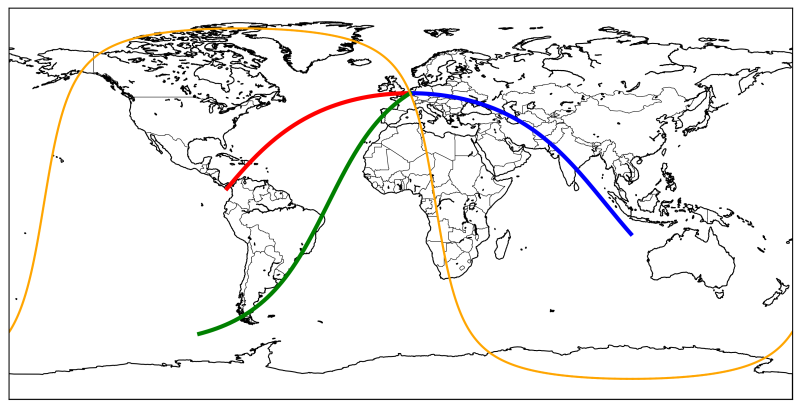 It will compute the locations along the great circle every “step” distance. glat1 = lat * np.pi / 180.
glon1 = lon * np.pi / 180.
faz = azimuth * np.pi / 180.
e = 2. * cz * cz - 1.
y = e + e - 1.
c = ((-3. * c2a + 4.) * f + 4.) * c2a * f / 16. ← Matplotlib Basemap: Tell me what you need ! This tutorial is great and very helpful. Thank you. Nice tutorials you have for Basemap. By the way. I am trying to draw some great circles that cross longitude 180 (or -180, as you want to see it). So my map has the borders at longitudes -220 an -45 and when I try to draw a great circle from west of longitude 180 to west of longitude 180, the great circles are not great circles but strange lines. Any idea of how to fix this?